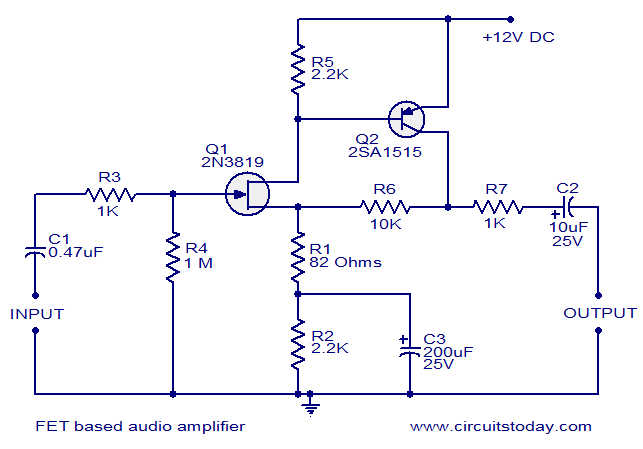 This is the circuit of a based audio preamplifier which has very low noise. One FET and one BJT are used in this circuit. The audio signal to be amplified is coupled to the base of FET Q1 using capacitor C1 and resistor R3.Base of transistor Q2 is coupled to the drain terminal of FET Q1. Transistor Q2 provides additional current gain. The final signal will be available at the collector of Q2.Capacitor C3 provides necessary negative feedback, which improves stability. Capacitor C2 is an output DC decoupling capacitor. Since an FET is used in the input stage this particular amplifier circuit has very high band width (10 KHz- 450 KHz) and input impedance (around 1M). For optimum performance, input and output grounds must be properly decoupled. hey what is the prescribed speaker rating for the output? Nice circuit. I’m assuming that the stated frequency response of 10kHz to 450kHz is a misprint and should read 10Hz?